While on hands and knees, interlace your fingers and place your elbows on the ground shoulder width apart. Place the crown of the head on the ground touching your wrists. When first learning kick up against a wall until you can safely hold the headstand without losing balance. This is a physical activation of the 7thchakra which brings more awareness to its location on the head. In headstand the blood rushes into the head for more mental clarity. If you have neck issues, don't do head stand. Instead while on hand and knees near a wall, you can press the crown of your head against wall. This will also bring a physical activation of you crown chakra. On your back with your knees bent, press your elbow and head into the mat and lift the chest up towards the sky. Adjust your head until it gets close to the crown without collapsing your neck. You can stay there for more ease and breathe or extent the legs up towards the sky 45 degree angle from the floor. As we activate the 7thchakra while in a backbend position, we can feel our limitlessness and connection with the world around us. Cross-legged seated pose is the traditional way to sit for meditation. If you're tight in the hips it's suggested to sit on something thick enough to allow your knees to rest below the level of the top of your pelvis. This will allow you to sit with more comfort and less effort so that you can focus on the crown chakra. As we practice this position while focusing of the 7thchakra at the crown of the head, we allow the wisdom within us to emerge. Meditation in hero pose is an easier posture for those with tight hips. Sit with a block under our sitting bones and your knees bent with your shins parallel under your thighs. Here as we feel the support of the earth, we begin to feel the support all around us. The name of this pose symbolizes the ultimate letting go, releasing ourselves from our body and this life. In this final resting position we surrender the effort of the body while the mind is fully present. As we focus on our breath coming in and going out, we learn to be open to all things coming in and going out of our life. Lay down on your back with your feet almost as wide as the mat and the hands about a foot away from your hips with the palms upwards. The shoulder blades should be on the back so that the head of the arm bones are close to the ground. Allow the body to relax fully with a few long deep breaths. With each exhale let all the tension from the body relax and release into the earth. As you inhale allow the breath to come into the body and uplift it with fresh oxygen and energy. Let the mind stay focused on the movement of the breath in and out of the body. Notice the ease of the breath. There is no holding of the breath in or pushing of the breath out. In the same way as we inhale and bring the breath into the body, imagine all of the experiences of life being embraced. As you exhale, imagine the people, things and experiences in our life moving outwards again. Allow this flow to continue with the breath until you can let go of the feelings that you need to hold on to any of it. I understand that you will use my information to send me The Chakra Support Newsletter. 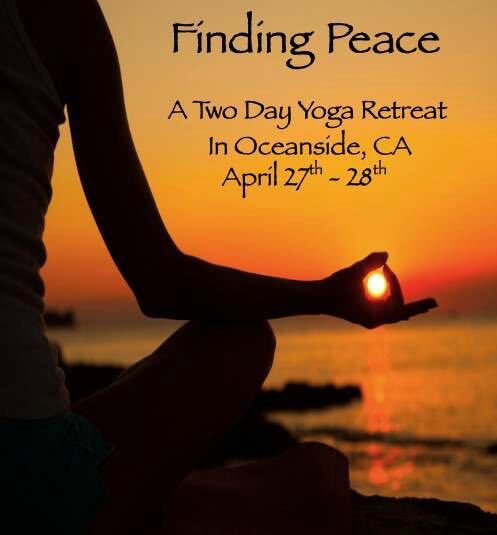 Learn the Art of Hatha Yoga on your journey deep into the heart of your practice. 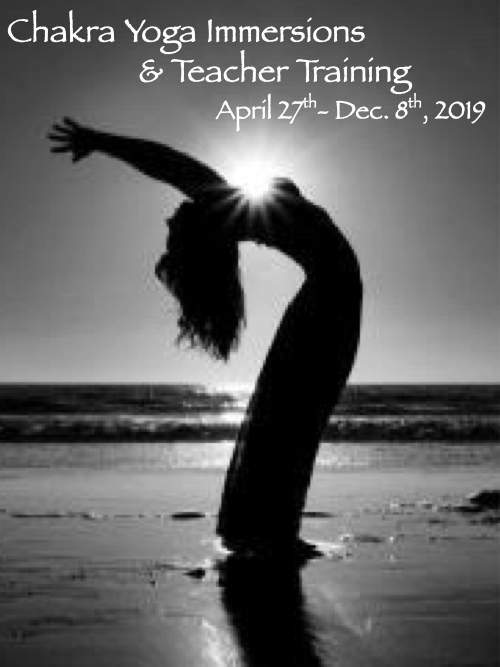 This Chakra weekend series which is an 200 hour yoga teacher training combines the powerful science of aligning your body with a heart oriented yoga philosophy. Click here for more info. A full day retreat at the Hidden Valley Zen Center designed to calm the mind and nurture the body. 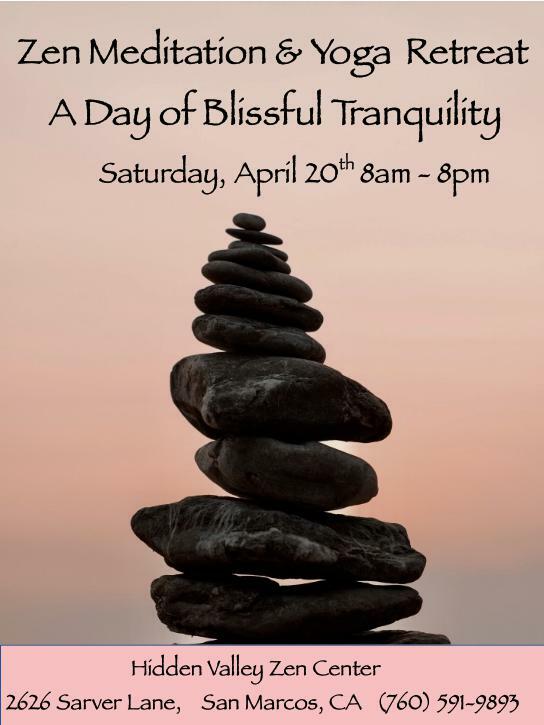 During this bliss filled day you will learn and practice Zen Meditation, do Hatha and Restorative Yoga, partake in Mindful Eating and enjoy the beauty of nature in Silent Walking Meditation.